Using this low-cost project one can reproduce audio from TV without disturbing others. It does not use any wire connection between TV and headphones. In place of a pair of wires, it uses invisible infrared light to transmit audio signals from TV to headphones. Without using any lens, a range of up to 6 metres is possible. Range can be extended by using lenses and reflectors with IR sensors comprising transmitters and receivers. IR transmitter uses two-stage transistor amplifier to drive two series-connected IR LEDs. 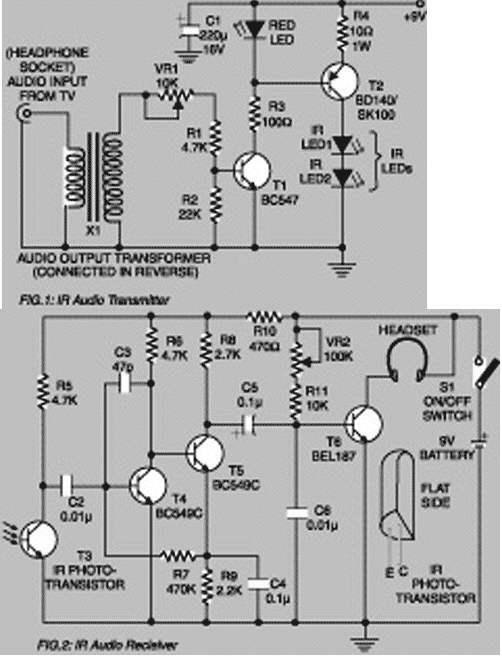 An audio output transformer is used (in reverse) to couple audio output from TV to the IR transmitter. Transistors T1 and T2 amplify the audio signals received from TV through the audio transformer. Low-impedance output windings (lower gauge or thicker wires) are used for connection to TV side while high-impedance windings are connected to IR transmitter. This IR transmitter can be powered from a 9-volt mains adapter or battery. Red LED1 in transmitter circuit functions as a zener diode (0.65V) as well as supply-on indicator. IR receiver uses 3-stage transistor amplifier. The first two transistors (T4 and T5) form audio signal amplifier while the third transistor T6 is used to drive a headphone. Adjust potmeter VR2 for max. clarity. Direct photo-transistor towards IR LEDs of transmitter for max. range. A 9-volt battery can be used with receiver for portable operation. Infrared Head Phones electronic circuit. Audio electronic circuits and schematics.